Home/News, Uncategorised/How does a non-surgical alternative to liposuction work? Simply put, we perform three main types of non-surgical body contouring treatments; fat removal, cellulite reduction and skin tightening. The treatment types can be utilised individually to target specific areas of concern. Or, they can be combined to make up a three-dimensional, complete approach to targeted fat reduction and body contouring – otherwise known as 3D-Lipo. Our 3D-Lipomed V2 machine delivers the latest ultrasound technology, which is widely recognised as providing effective circumference reduction and localised fat loss solutions as a non-surgical alternative to liposuction. The thing is, each client is different and, as such, knowing which treatment type is right for you can start to get confusing. 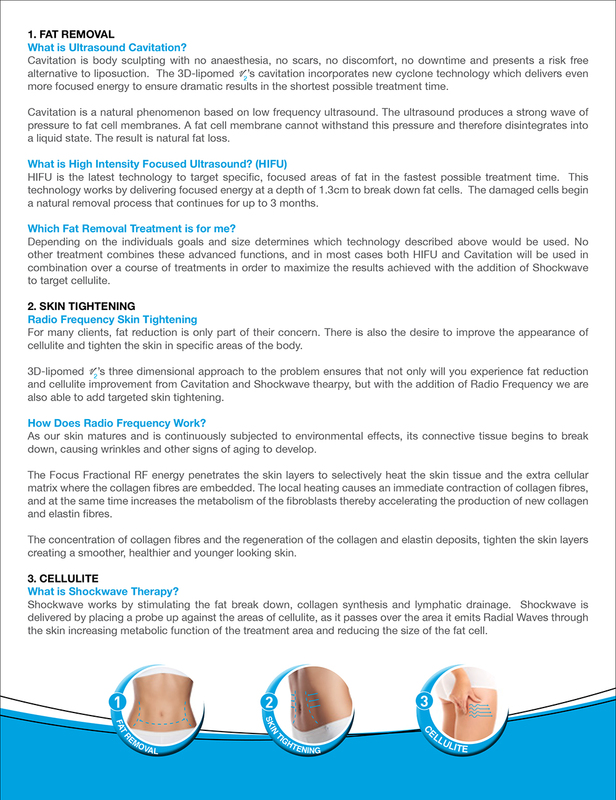 To make things easier, here’s 3D-Lipo‘s rundown of treatments for the three main focus areas. If you read this and feel that 3D-Lipo may be right for you, the best thing to do is to get in touch so that we can discuss your areas of concern and suggest a bespoke treatment plan to suit your needs. But that must be horribly expensive, right? Well actually…No. At Crown, we pride ourselves on offering affordable body contouring solutions. And it doesn’t cost anything to say hello and find out more. If you’d like more information on how the above treatments may work for your specific body contouring needs, say hello on 07961 621634 or at hello@crownwellbeingclinic.co.uk. Or message us on Facebook or Twitter – we respond daily.